I sailed away to America to view that happy land. That the spirits of good nature lies in this Irishman. For to make her bless the day that she wed with this Irishman. I sang this song for singer Len Graham of County Antrim, Ireland and he immediately recognized it as a version of “The Roving Journeyman” aka “The Little Beggerman.” I learned another version when I was a teenager up in Bemidji, MN but I didn’t realize they were related because I had a different melody (the one often called “The Red Haired Boy”) for my earlier version. Dean’s air is much more somber. 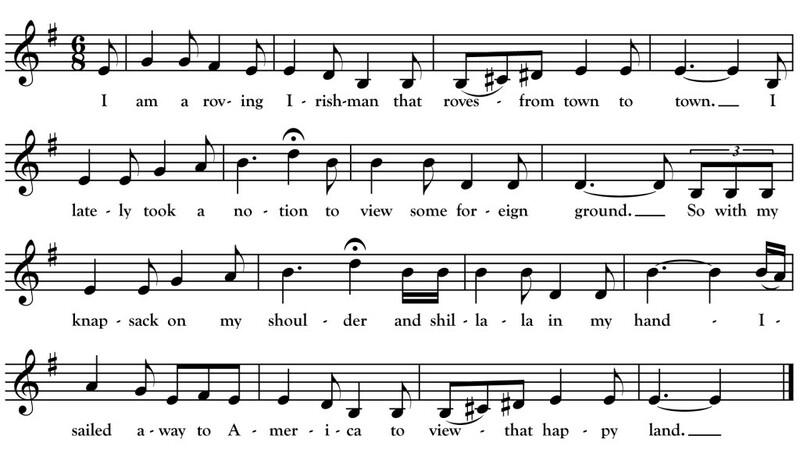 Later, I came across a version, called “The Rambling Kerry Lad,” recorded from Bridget Granbhil of the Dingle Peninsula that is very similar in melody and text to Dean’s version. You can hear Granbhil’s version on the Folkways album Traditional Music of Ireland, Vol. 2: Songs and Dances from Down, Kerry, and Clare. The song was a vehicle for the “traditional creativity” of other “woods singers” in Dean’s childhood home of St. Lawrence County, New York. Two personalized versions, “The Roving Cunningham” and “The Roving Ashlaw Man” were recorded there by Robert Bethke in the 1970s from brothers Ted and Eddie Ashlaw. Listen to other versions online!